Know the ExactSet™ precise time and weather all in one with this Oregon Scientific clock and weather forecaster. Now you can monitor the temperature - indoor and outdoor - all from the comfort of your desk or nightstand. Kinetic movement icons display the forecast for the next 12-24 hours: Sunny, Cloudy, Partly Cloudy, or Rainy. 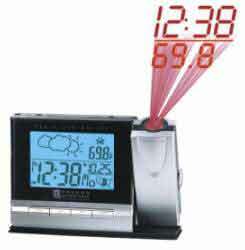 Activate the projection feature, which displays time and outdoor temperature by hitting the snooze or use the included AC adapter to continuously display the time and temperature in soft glowing red numbers on the wall or ceiling. The projection can even be rotated 180 degrees and focused for added convenience. The alarm has an 8 minute snooze.